Published in the Journal of Epidemiology and Community Health, the study used data from the EPIC Norfolk cohort study, which is tracking the health and wellbeing of thousands of residents of the English county of Norfolk. The researchers from the University of East Anglia (UEA) and Centre for Diet and Activity Research (CEDAR) at the University of Cambridge found that owning or walking a dog was one of the most effective ways to beat the usual decline in later-life activity, even combatting the effects of bad weather. As bad weather and short days are known to be one of the biggest barriers to staying active outdoors, the researchers linked this data to the weather conditions experienced and sunrise and sunset times on each day of the study. Lead author of the paper, Dr Yu-Tzu Wu, said "We know that physical activity levels decline as we age, but we're less sure about the most effective things we can do to help people maintain their activity as they get older. "We found that dog walkers were much more physically active and spent less time sitting overall. We expected this, but when we looked at how the amount of physical activity participants undertook each day varied by weather conditions, we were really surprised at the size of the differences between those who walked dogs and the rest of the study participants." Project lead Prof Andy Jones said: "We were amazed to find that dog walkers were on average more physically active and spent less time sitting on the coldest, wettest, and darkest days than non-dog owners were on long, sunny, and warm summer days. The size of the difference we observed between these groups was much larger than we typically find for interventions such as group physical activity sessions that are often used to help people remain active." The researchers caution against recommending everyone owns a dog, as not everyone is able to look after a pet, but they suggest these findings point to new directions for programmes to support activity. 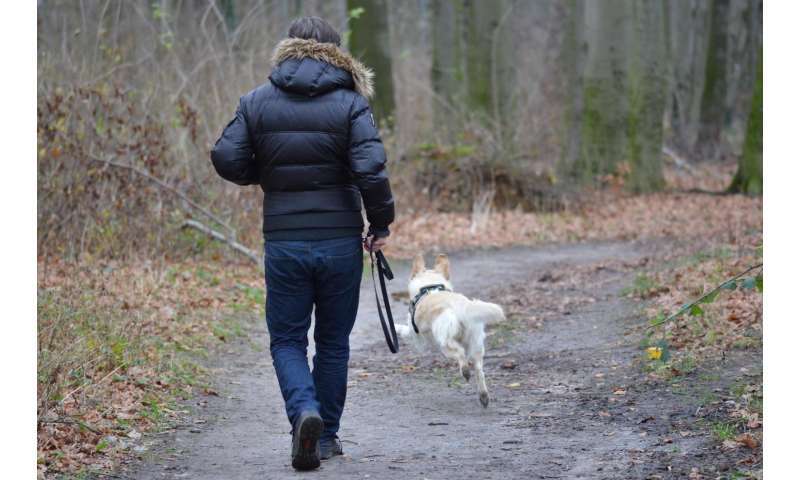 Prof Jones said: "Physical activity interventions typically try and support people to be active by focussing on the benefits to themselves, but dog walking is also driven by the needs of the animal. Being driven by something other than our own needs might be a really potent motivator and we need to find ways of tapping into it when designing exercise interventions in the future." 'Dog ownership supports the maintenance of physical activity during poor weather in older English adults: cross-sectional results from the EPIC Norfolk cohort' is published in the Journal of Epidemiology and Community Health.